When you write a first draft of a novel, you may be prone to spaghetti problems. The term was coined by Jon Franklin in his book, Writing for Story, which is about writing nonficiton; but it’s a useful concept for any type of writing. Spaghetting is when you are writing along without a clear idea of where your story should go and you wake up one morning and the story is so tangled it seems like a plate of spaghetti. This happens to organic writers (otherwise known as those who write by the seat of their pants, or pansters), but also to those who are semi-organic-semi-planners (sometimes known as plansters). Strict outliners might avoid this problem, but they will have problems of their own. I am a Semi-planner: I know the overall thrust of the story, the character’s main emotional arc and where the story will end. With that in hand, I semi-plan the opening act, then start writing. I know that somewhere in there, I will have to stop and re-plan the next section of the story. That’s because the story tends to spaghetti. Spaghetting can happen when you decide to take off on a tangent, just to see where the story might go. And it might go straight into spaghetti; or it might take off into space, with celestial angels channeling through you. Mostly, mine spaghettis. When this happens, don’t panic. (Oh, it’s at THAT stage.) Instead, you must put on your left-brained analytic hat and look at what you’ve done. Where did the story start to get off track? Try to pinpoint the exact place where something started going wrong. Put your cursor at that spot and highlight everything after it. Cut and paste that spaghetti section into a new file and call it Spaghetti-1. I hate to delete anything totally! There may be a couple things in that file that I need. And then, analyze where you are in the story. What has happened up till now? Where is the character on his/her emotional arc? List possible scenes for what might happen next and work on plotting from this point onward. You may need to go back and clean up traces of spaghetti sauce in previous chapters, but you can probably go forward and wait till the full draft is done. This is a much better strategy than abandoning a mss after 100 pages–something I’ve been known to do. Instead, get rid of spaghetti pages, replot and get that first draft done. Thanks for writing about this. I experience spaghetti, and because I’m new to writing for real, I just worried I was a bad writer – wasn’t cut out for this. Nice to know it’s fairly common. 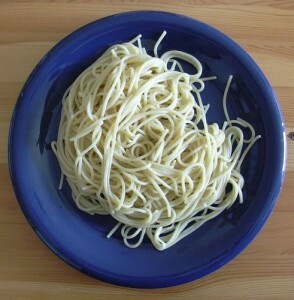 Jenny: Absolutely, spaghetti chapters are normal. The key is to recognize them for what they are. Ann: LOL on the messed up chapter numbering. Great analogy! Sometimes I’m a pantser, sometimes a planster. I try not to be a plaster (putting a bandage on the problem). But it’s tempting!